Tracking your expenses is especially useful when your outgoing cash flow exceeds your income. Fortunately, you don’t need to go back and tally up months’ worth of checking account registers, credit- and debit-card statements, and cash withdrawals. This is a very time-consuming and painful exercise. Just estimate! Use the Cash Flow Monitoring worksheet to help you monitor your spending for the next couple of months. As you pay your bills, complete the worksheet. 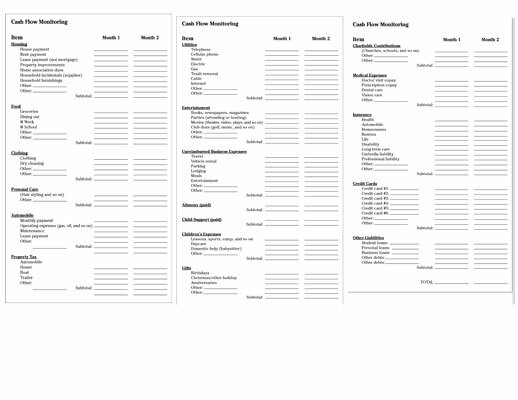 Click here to download and print the Cash Flow Monitoring worksheet. If you’re looking for a simpler method of tracking your expenses, you can use the Expense Tracking Log to track every cent of just the surplus money — after all your taxes, bills, and other necessaries are paid — that you have to spend. 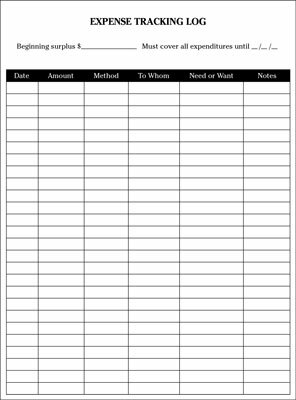 Click here to download and print the expense tracking log. Write down every occasion you spend your surplus money, whether you buy your morning coffee, an afternoon soda at work, or gas on the way home. Account for every cent. Also, track whether you paid with cash, check, debit card, or credit card; whom you paid; and whether the expense is a need or a want. Use one log for each pay period. Note at the top of the worksheet how much your beginning surplus is (which you’ll need to figure separately) and subtract from that amount each expenditure. By keeping your eye on the “magic number” (your surplus cash flow after meeting your required expenses), you can simply spend your money any way that pleases you — so long as you don’t exceed the “magic number.” No more detailed budget keeping required.